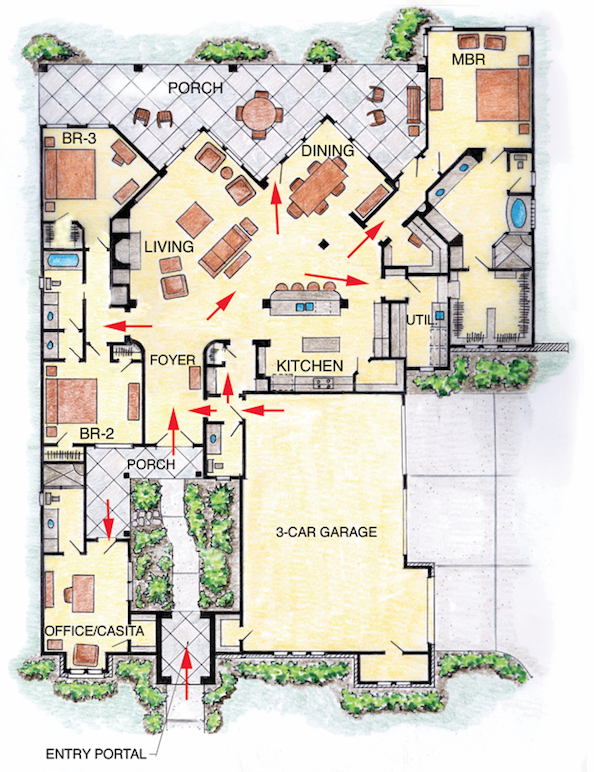 A critical element of any floor plan is the traffic pattern—how one travels from one room to another. The best way to determine whether a plan has a logical traffic flow is to imagine living in the house and how you might walk from one area to another. As you enter the home from the front door or the side entrance, how will you reach the kitchen? Do you first have to pass directly through the living room? What if you want to walk from the living area to your bedroom? Ideally, one is able to move from one area to another without crossing diagonally through any room. Room sizes in designs with carefully thought-out traffic flow or travel paths can often be smaller since rooms must only be large enough for furniture placement, without extra space for walking paths. The next time you visit a large furniture store, look carefully at the room vignettes. You’ll see very cozy living rooms with plenty of seating and entertainment area in a surprisingly small footprint because there’s no traffic through the space; rather, you’re simply walking past it. 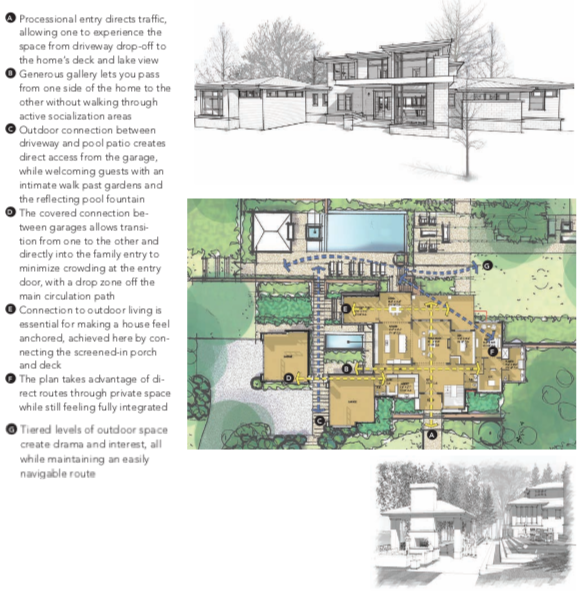 The following pages feature several plans from our design team offering thoughtful examples of well-conceived traffic flow in an assortment of home sizes. C) Foyer becomes a “traffic hub” as it provides a path to bedrooms 2 and 3 while also directing traffic between the kitchen, living, and dining areas. D) Placing the rear porch access between the living and dining area eliminates the need to “walk directly through” either of these areas. This open floor plan offers views to the rear outdoor living space from several areas. Adjacent to the kitchen is a small alcove with a desk and plenty of storage that functions as the command center for the home. The secluded location of the casita and private bath make it ideal for a home office or guest suite. Both the formal front door and the service entry from the garage open to the central foyer. From here, traffic is directed to the bedrooms, the utility area, and the rear porch without actually walking through any room. 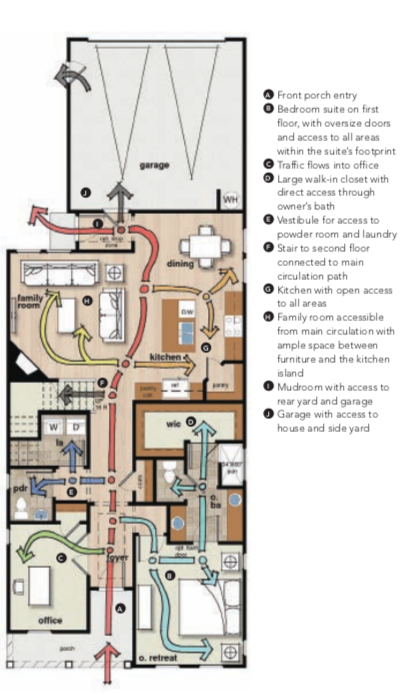 Whether it’s getting groceries from the garage to the kitchen or trying to leave without waking your partner, travel paths are important design considerations in any home. This plan provides several options. 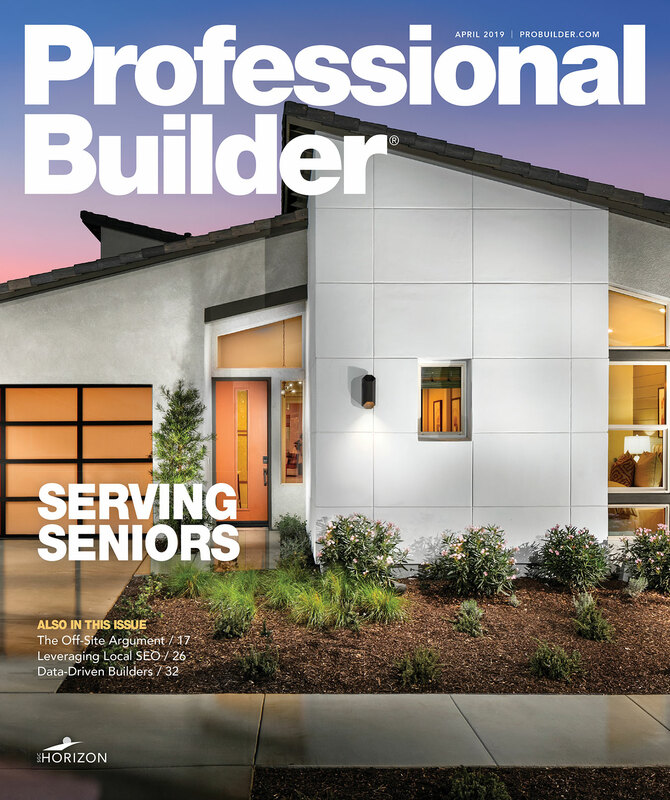 It also addresses the potential for a multigenerational household, as the rear corner features a separate unit and the front corner is easily converted into a suite. 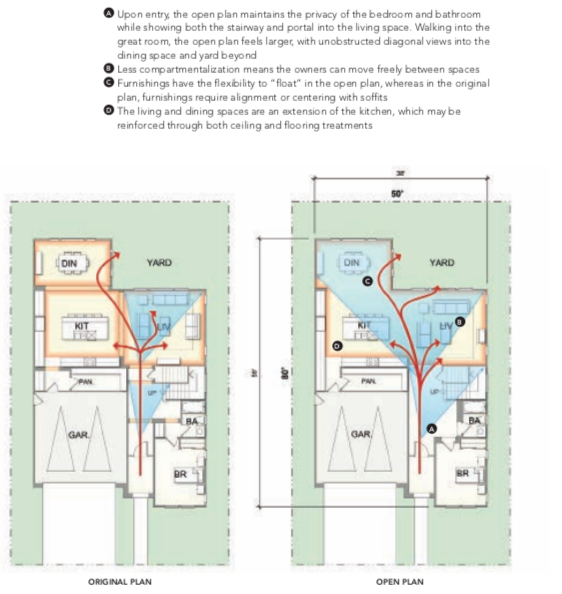 Inheriting the original plan, shown below, the client’s goal was for our team to both open up the feel of the plan and maintain the zoning of spaces and the original footprint. Through a series of subtle plan adjustments, the open plan responds to better circulation through the spaces, both visually and physically as one moves through the plan. Traffic flow and circulation are critical for good plan design. Plans that are narrow and have the owner’s suite on the main floor can be challenging. 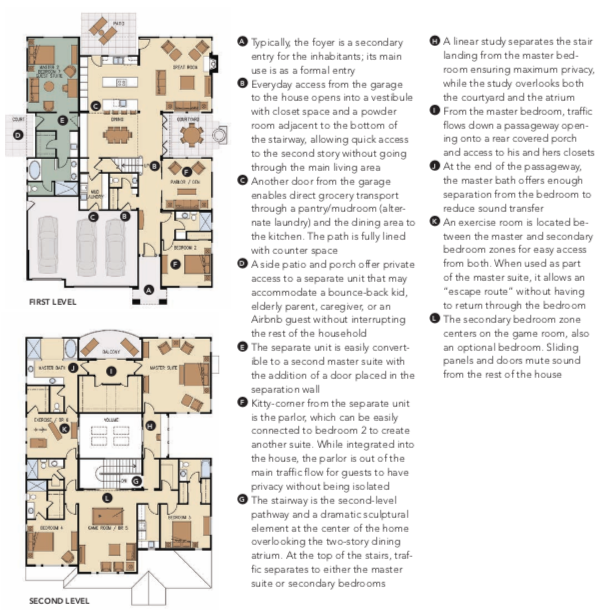 This active adult plan provides all of the features for main-floor living and maintains good circulation throughout. The thought behind this design was to allow free-flowing connections between spaces while capturing incredible views, thus creating a strong visual experience. It was important to avoid areas of congestion and allow for seamless connections between indoor and outdoor spaces. In collaboration with landscape designer Patrick Zaremba of Zaremba & Co., in Pontiac, Mich., the design establishes thoughtful traffic patterns inside and outside of the home. The flow is designed not only to allow one to traverse both indoor and outdoor spaces, but to fully appreciate that experience, as well.